The youth of the UK are setting an example for the world by taking a stand against the ongoing environmental abuse that has increasingly plagued our planet. Thousands of high school students have been gathering in the streets across the UK for the past few weeks to protest the current lack of government support for ecological problems like climate change. With these mass protests, young people are showing that they do have a voice, forcing people to listen. Students at Southern Nazarene University (SNU) are matching the passion of these high schoolers and are in full support of their cause. While climate change action is the main cause of their protest, the students are calling on the government for specific changes like declaring a climate emergency, making environmental education a requirement in school curriculum, and lowering the legal voting age to 16. Although some students had mixed opinions on lowering the voting age, many students and faculty agreed that the U.S. government is not doing enough to participate in the solution of the ecological problems ailing our planet and that Americans need to start taking a stand the way the young people of the UK are right now. The UK protests are proving that there are a growing number of individuals ready and willing to make a change for the betterment of our planet. 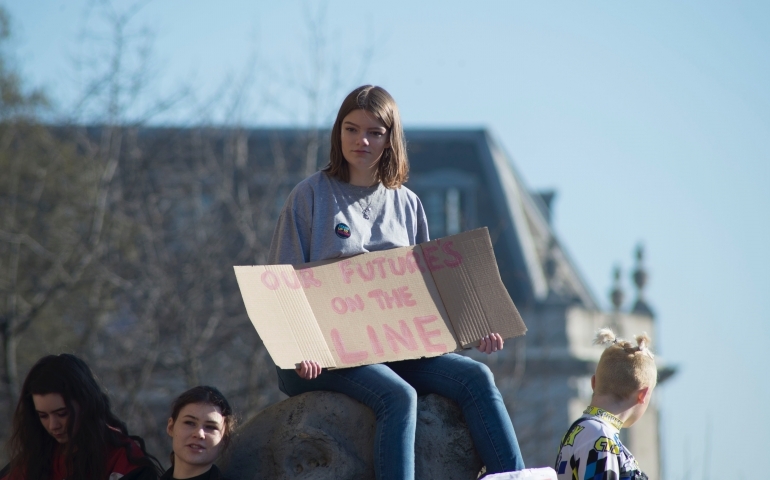 Environmental care will no doubt continue to be a controversial topic- but as long as the conversation is still going and groups like the UK students are speaking out, people will continue to have hope for the future.